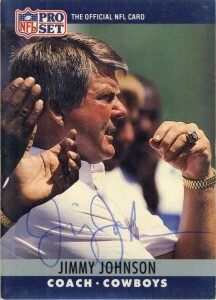 Coach Johnson would be one of the first autographs that I’d get at training camp at St. Edwards in Austin, Tx. With his trademark hair, Jimmy has an alpha personality, loves the limelight, and signing autographs, sometimes by the dozens in his golf cart before and after practice. 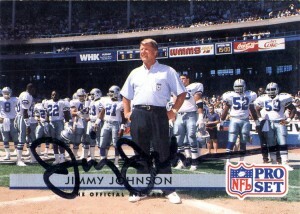 This timing was tough for Jimmy as he was taking over for coaching legend Tom Landry. He arrogantly proclaimed with Jones at their initial press conference that he’d have the franchise turned around in 3 seasons time- ostracizing many loyal fans who preferred the quiet, professional demeanor of Landry. 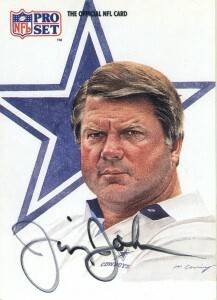 After an initial extremely rough 1-15 start in 1989, Johnson would begin to right the fortunes of the Cowboys, and winning melts most resentment. By season 3 the Cowboys were back in the playoffs, and won consecutive Superbowls in 1992 and 1993. 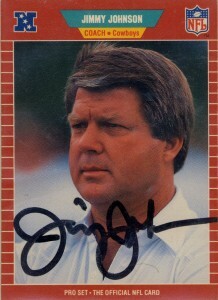 Johnson orchestrated the most lopsided trade of all time, trading runningback Herschel Walker to the Minnesota Vikings for a bevvy of draft choices and players. Jimmy had an eye for talent, and while not having the final say on all draft choices, played a large part in locating talent and underrated free agents, signing often Miami Hurricanes that he was familiar with as situational players. After leaving the Cowboys over personal differences with once friend Jerry Jones, Jimmy briefly retired from coaching, turning to the broadcast booth. He was offered the head coaching job for the Eagles in 1994, but declined, instead taking over for legendary Don Shula and the Dolphins in 1996, where he’d coach through the 1999 season. Although he’d guide the team to 3 playoff appearances, he’d not move beyond the divisional round and cited burn-out as his reason for retirement. Since re-retiring Johnson has remained front and center on Fox’s NFL pregame show and the College Championship Series and owns a restaurant in Miami. An extensive coaching tree has formed from Jimmy, including Dave Wannstedt, Butch Davis, and Norv Turner. 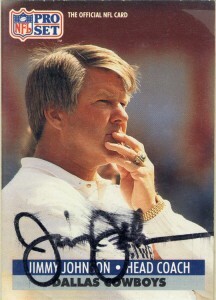 Jimmy Johnson is also the only coach to win a National Championship and the Superbowl. He’s also done a bit of bit acting, on “The Shield”, “Coach”, and “The Waterboy” and in commercials. In 2006, Johnson was linked briefly to the Houston Texans as a dark horse candidate for the open coaching job, but declined the reports as pure speculation. Jimmy is a huge fan of the series “Survivor” and was cast in the 2010 season. Oddly despite his accolades Jimmy has not been inducted into the Pro Football Hall of Fame for his coaching accomplishments with the Cowboys.